I had an epiphany recently, and it wasn’t a pleasant one. I have a horrible habit of crawling up into my head to see what’s there. More often than not I merely notice what’s missing, but that’s another story. This happens most often while I’m in the shower. My wife likes to point out that I sometimes take long showers. I do this because I literally forget I’m in the shower. I get utterly lost in my head, like that dude in the movie Hook who couldn’t find his marbles. And this life-changing epiphany was followed by another, more horrifying epiphany: My book is a literal trip inside the mind of Darren. The previous paragraph shows why this is so horrifying. This realization immediately threw me from my watery shower stupor. I shut the water off. I trembled into the bedroom praying that God would somehow pull my book from the shelves and burn every copy to a crisp by throwing them into the fiery pit of hell (no offense Rob Bell). But it would appear He’s not answering that one (God, not Rob). Guess I didn’t pray with enough faith. So, I suppose this is simply a warning to everyone everywhere: Please don’t read my book. You might see things you never wanted to see. Don’t get me wrong, I highly encourage you to buy it, especially since I believe it to be your only ticket into heaven. And I want all of you to get into heaven, so please, by all means, go buy my book. 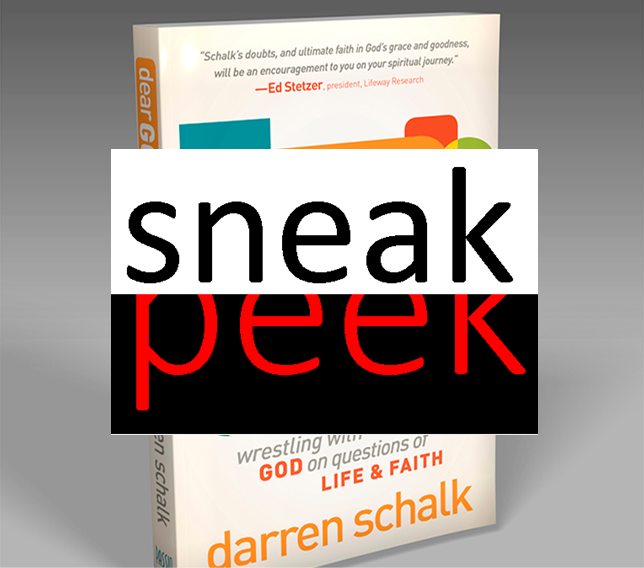 (In fact, you can pre-order your ticket into heaven even now, since it will be released March 4th.) I’m just asking that you don’t read it once you buy it. Or, if you do read it, never speak of it to anyone. I hope this will show you how horrible an idea it would be to read it once you buy it. I recently had a realization of just how lazy I can be. Much to my surprise (and probably hers), Kristi had nothing to do with my discovery. I enjoy working out. I hate running and bike riding, but I like weightlifting. I find it to be a welcome release from the usually stressful, deadline-filled workweek. For this reason I often go to the gym before work. When I go in the mornings, I shower and get dressed there. One morning after finishing my workout, I went to grab a couple towels. The rack has three shelves, all normally filled with towels. The middle rack is the most convenient to take from, in my opinion, because it’s right at arm level, whereas grabbing from the top or bottom calls for unneeded reaching or bending. If the middle towel rack is filled with towels, I rarely grab from any other tier. There have even been times when the towels on the other two not-so-convenient racks have looked ever-so-fluffy. They called out to me as I approached the rack: “Darren, look at us! We’re soft and fluffy, fresh out of the dryer. We smell good. We feel good. Use us!” But inevitably I’ll take a towel from the Rack-o-Convenience—even when its towels are old, ratty, and smelly. It’s just easier that way. On this particular day, though, the middle rack was empty. This annoyed me. Apparently my fellow gymgoers were as lazy as me, and they depleted the Rack-o-Convenience of every single towel. I had to bend down and grab two towels from the bottom rack instead. Didn’t they know I’d be coming to take towels from the Rack-o-Convenience? Not one person was kind enough to leave me a towel on the middle rack—not one! Had I seen the guy who took the last towel from the middle rack, I may have had a few choice words for him. Unfortunately I came to a conclusion: I am lazy. I argued with myself for a few moments. “You’re not lazy. Yes, you are. No, you’re not. Yes, you are. You just got upset over having to bend down for a towel!” Yep—lazy it is. 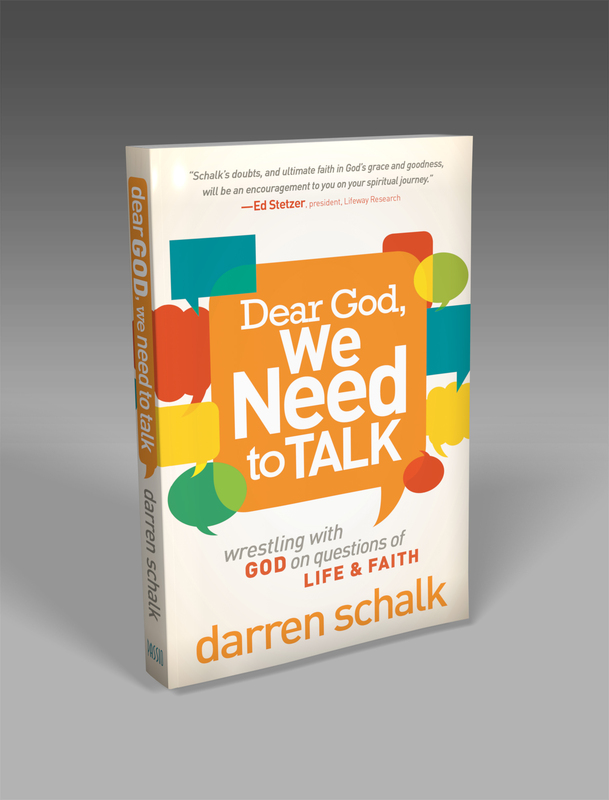 Look for your ticket to heaven (aka, Dear God We Need To Talk) on bookshelves March 4th! You can find out more info here.